State of my nails - don't ask! Anyway here's some sparkly skittles. Dollish Polish - Merry Christmas.. Sh*tters Full! Your nails look like mine did during finals week and I nervously bit them all with the stress. At least you are painting your nubs and not afraid to show them. I hid mine ashamedly. 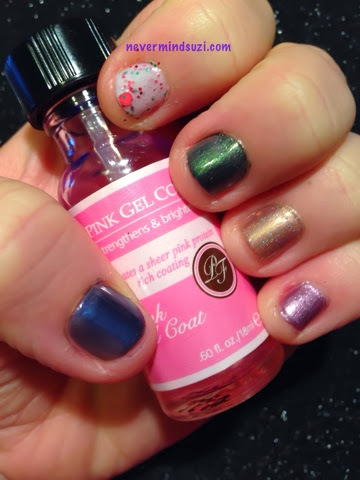 Also, what do you think of the pink gel topcoat you are holding? Is it any good?